One of my signature designs is the Chaos Pebbles ‘Split Lane’ tooling pattern. Over the years it has become my most popular request; it is unique, interesting and definitely not ordinary. 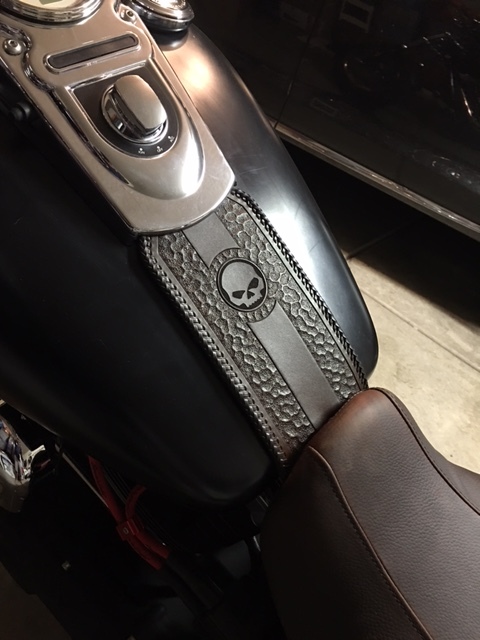 Back in 2012, a client came to me and asked for a custom Honda fender bib that no one has seen before…he gave me full creative license as long as it was cool looking. Over the course of the job I designed his bib and then developed a six step process so that each future bib would have a unique fingerprint-like background tooling. 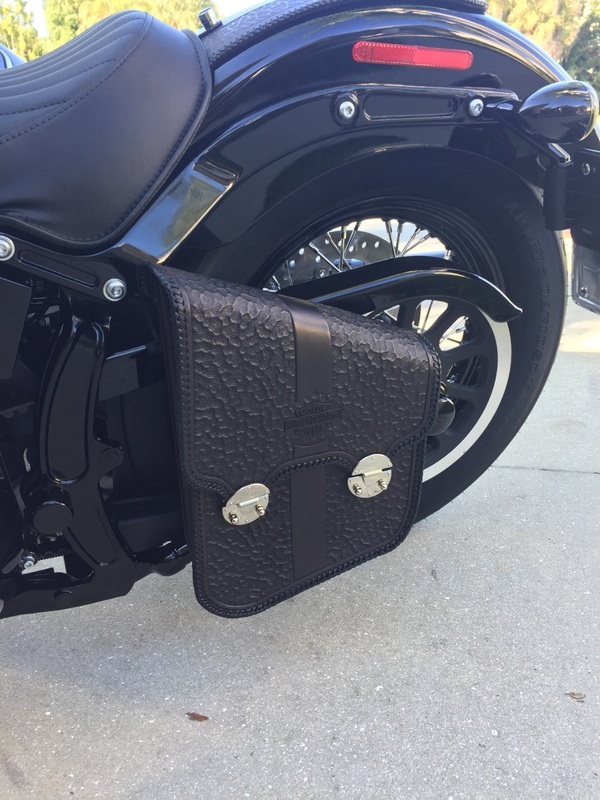 No two bibs are exactly the same but matching sets including handlebar bags, tool bags, swingarm bags, tank & fender bibs as well as wallets and belts could all be done. 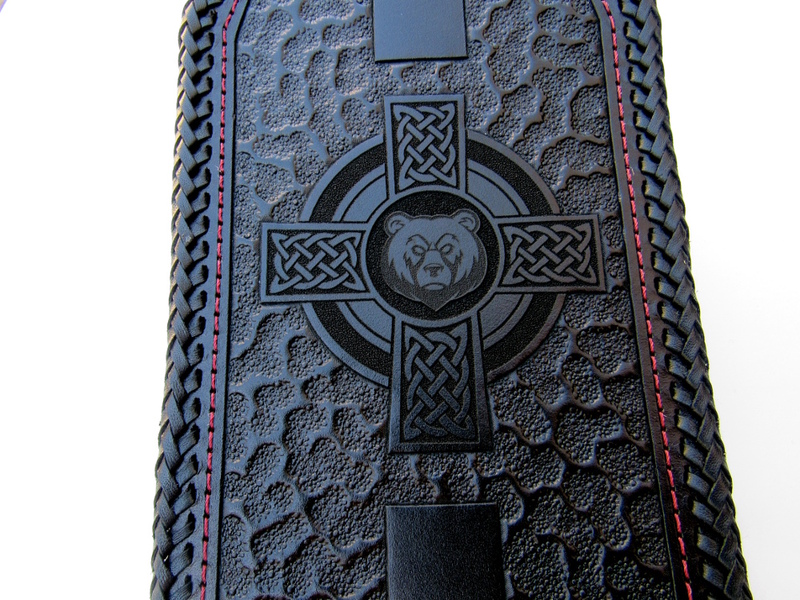 Since then, it’s been refined and I’ve added laser engraved center icons as well as hand tooled versions to allow folks to share their interests, hobbies, logos, and more; all set in a unique pattern. 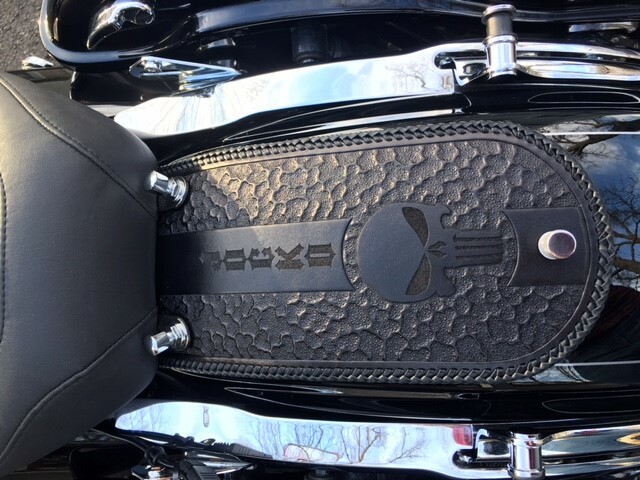 Today, this is my most popular custom Harley fender bib design and with the addition of the colored accent stitch lines, it personalizes even further. Add Chrome spots? No Problem! I’ve laid them out to fit on the outside or down the center bar, we can even do black pyramid spots for those wanting a more aggressive look. 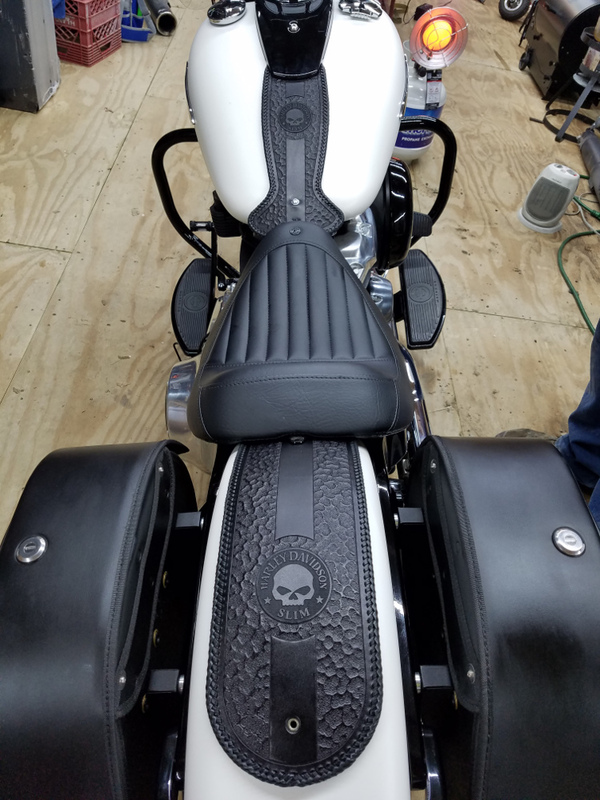 Scroll down to see some of the newer, updated designs I’ve done on custom Harley fender bibs, tank bibs and bags in the Chaos Pebbles design. 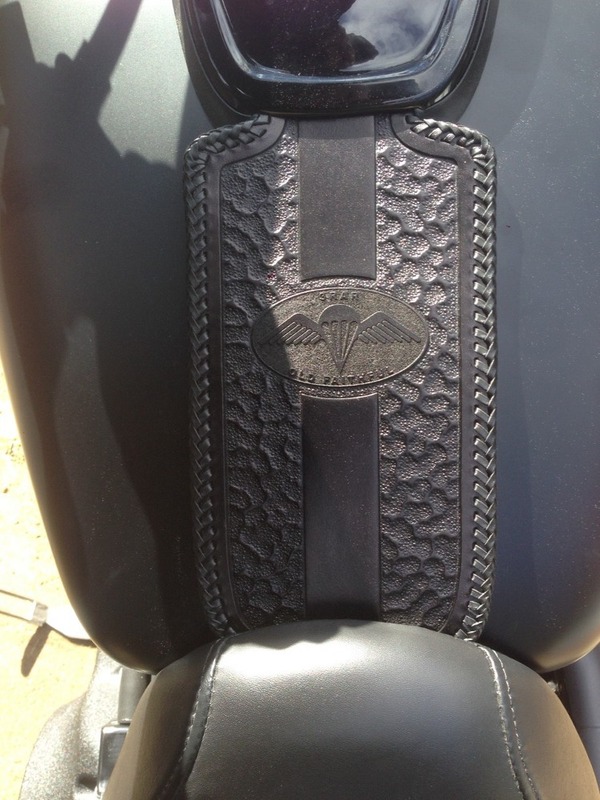 Take a look and drop me a line when you’re ready to order your own custom Harley bib set! It has been ages since I posted here to the blog, mainly because Facebook and Instagram are so much easier to use. But it seems a good number of folks keep swinging by to check out Three Mutts Customs so here are a few pics to show what we’ve been up to lately. 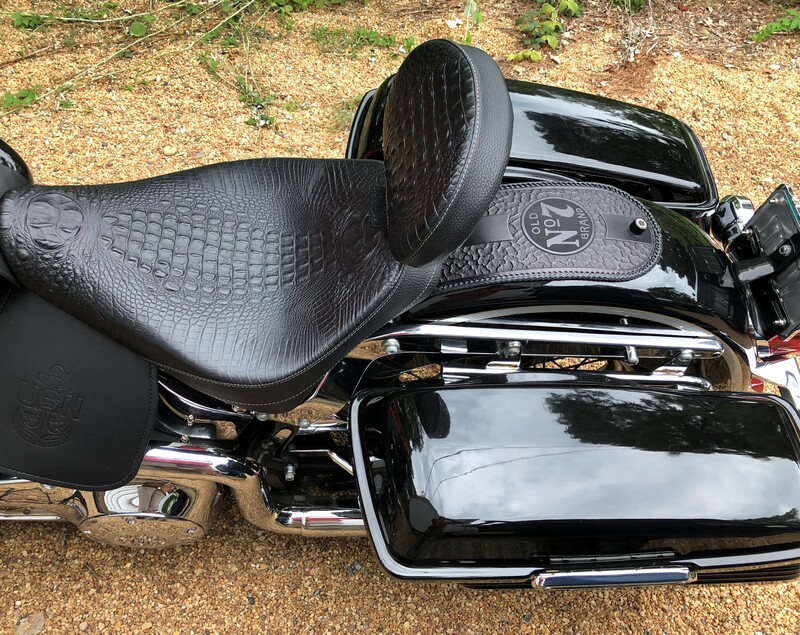 Of course hand tooled fender bibs, tank bibs and custom bags are still our specialty but now we’re matching to the popular seats more closely. Mustang distressed brown material is in stock, a new relationship with LePera allows us access to ALL of their materials and Corbin matching material is possible now too! Custom embroidery in house! An inexpensive way to apply full color designs to your custom bib. 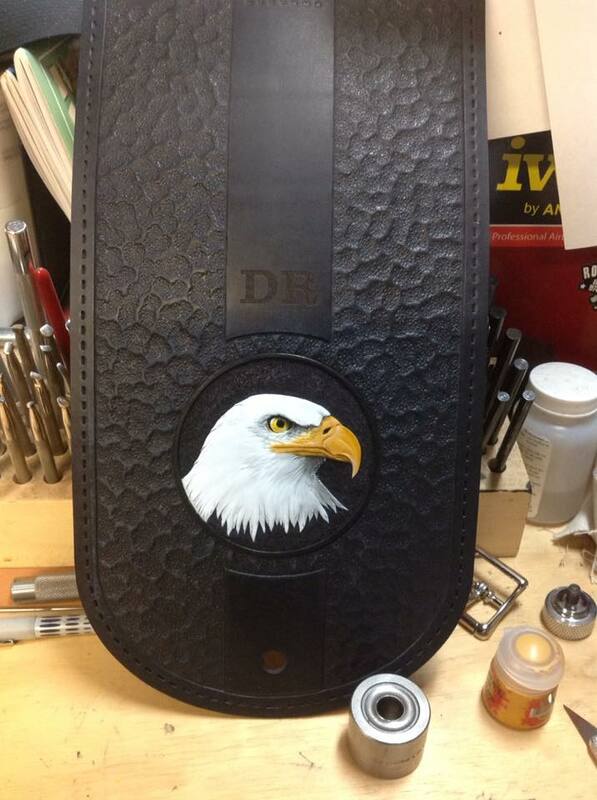 Brown tank bibs material matched to Mustang seats, both in plain and diamond stitch! More Chaos Pebbles with the new full body and Split Lane designs! 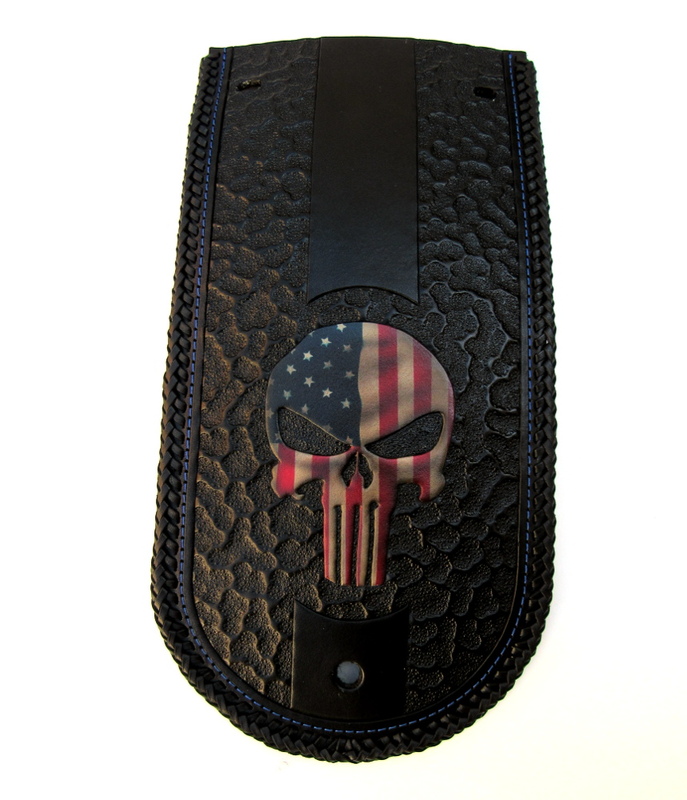 And for those that want to go full tilt for a full custom, there are always hand tooled & airbrushed possibilities. 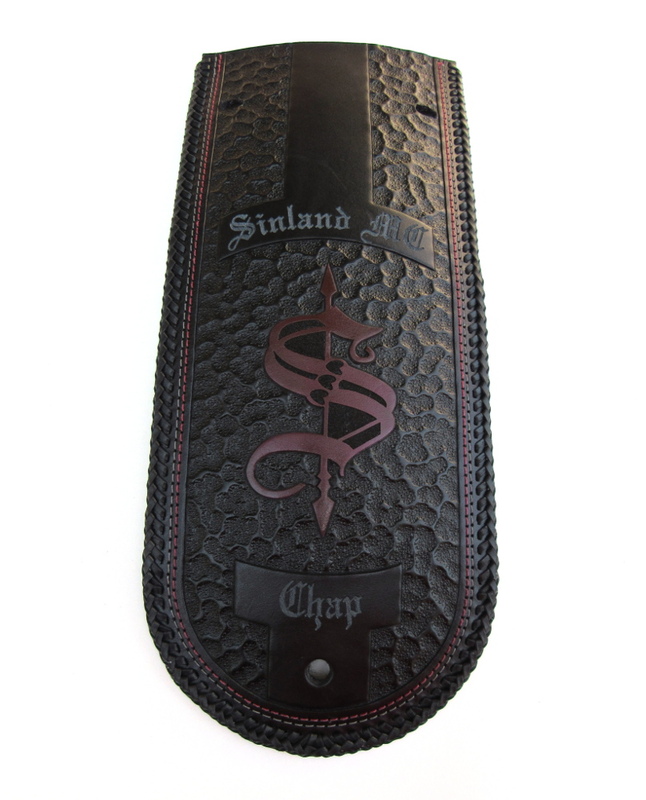 Three Different Tank bibs for Harley Softail Slims! 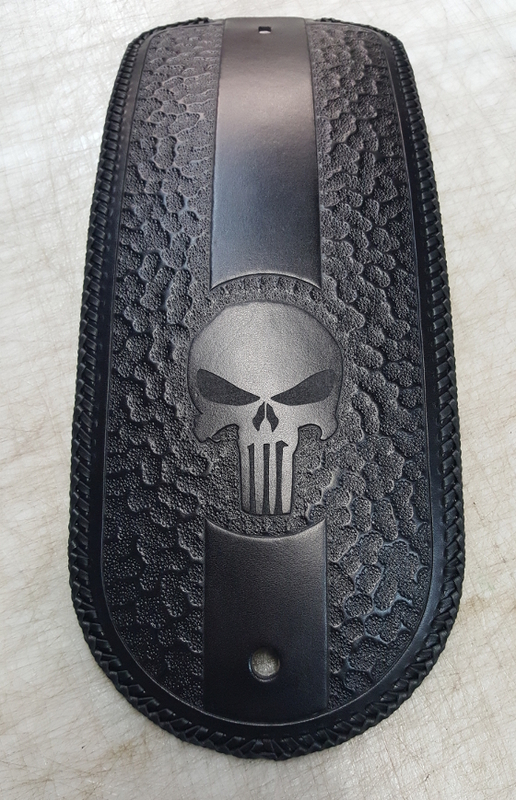 I noticed folks searching for tank bibs for the Harley Softail Slim lately so I thought I would put together a post to show the three different designs I have for the Slim. 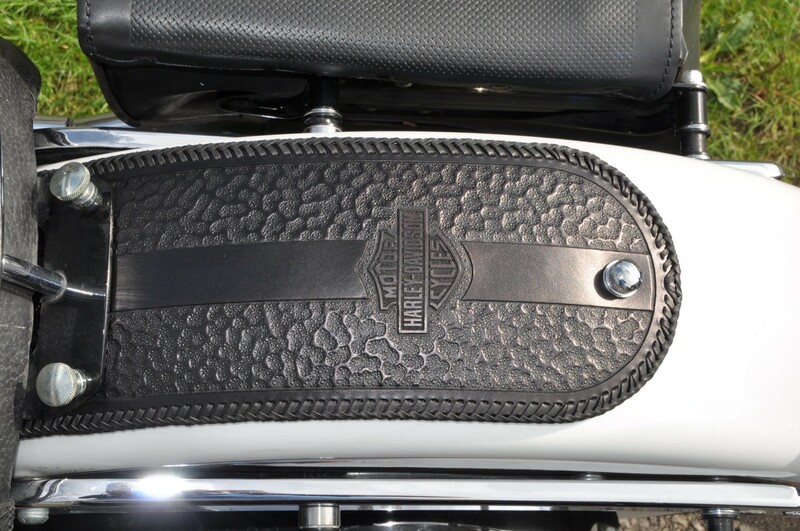 As Slim owners will already know, the factory tank bib is narrow and tapers from the dash point to the tank cut out and then folds over the frame backbone. 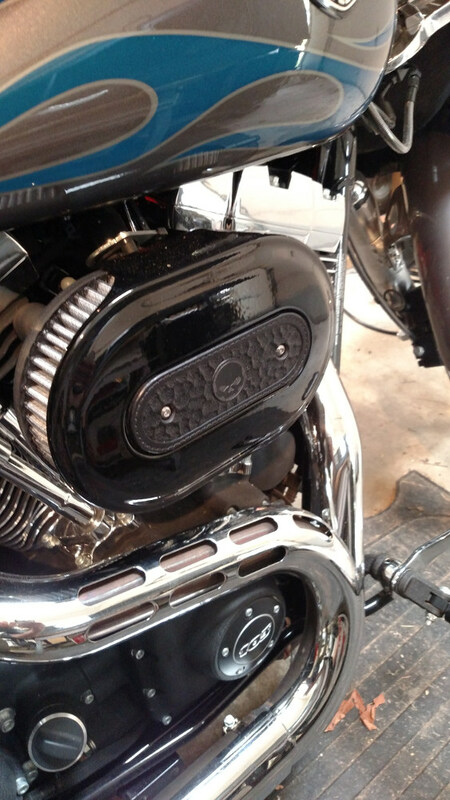 What you may not know is the Softail Heritage tank bib is the exact same. This means you can use the wider 5″ wide Heritage tank bib as well. 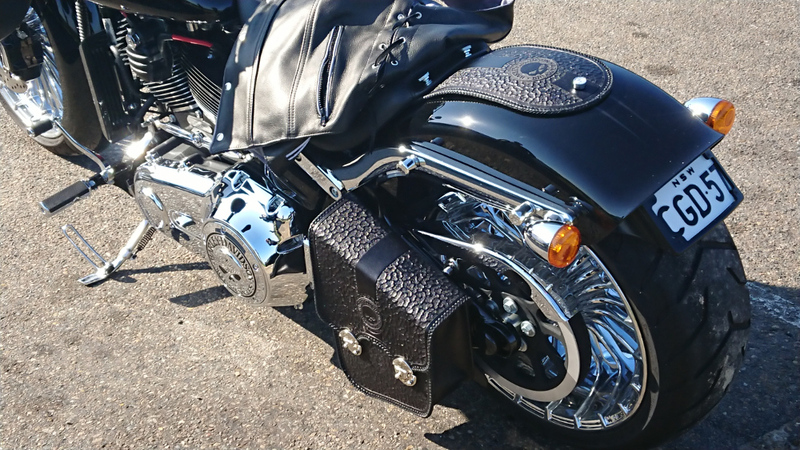 I also make a full compliment of rear fender bibs and tool/roll bags for your Softail Slim to create a matching set of custom leather! 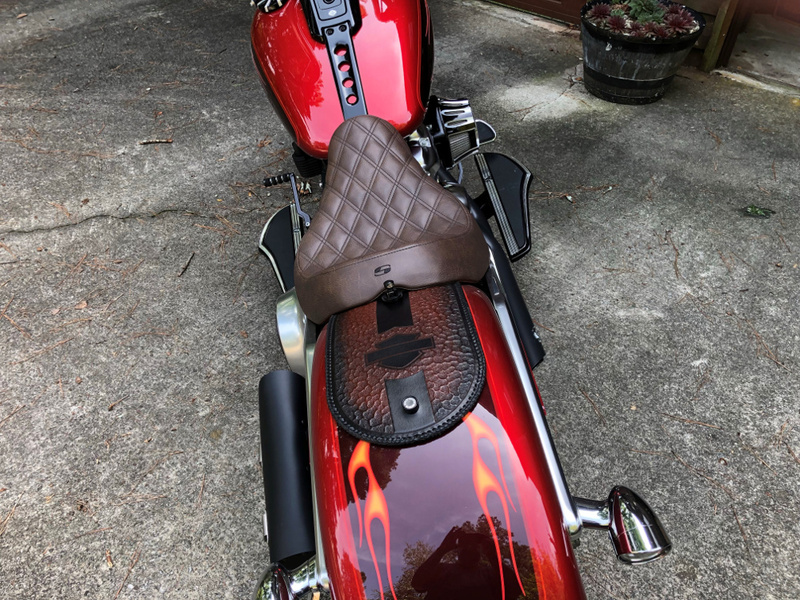 A recurring client and now friend of mine in Switzerland came to me originally early this year for a custom leather tank bib to match his custom seat from a shop in New York. This seat is something I had never seen before but I quickly recognized the color as saddle tan, a common color in horse saddles. By itself, the seat looked lonely, a bit out of place with it’s bright golden tan color on a black bike. We discussed the bib some and he decided to stick with the same shape as the factory bib but wanted his highly detailed family emblem on it. Using a combination of laser engraving and hand tooling, I was able to recreate it in exacting detail, including the text on the banner. Thick, white hand stitched edges were required to match the seat so I set to work. Together they looked great but the backend needed something so Umberto sent another email, asking about a custom roll style bag to fit between his custom seat and custom fender. I have to wonder how many parts on his Softail Slim are factory besides the engine and frame. 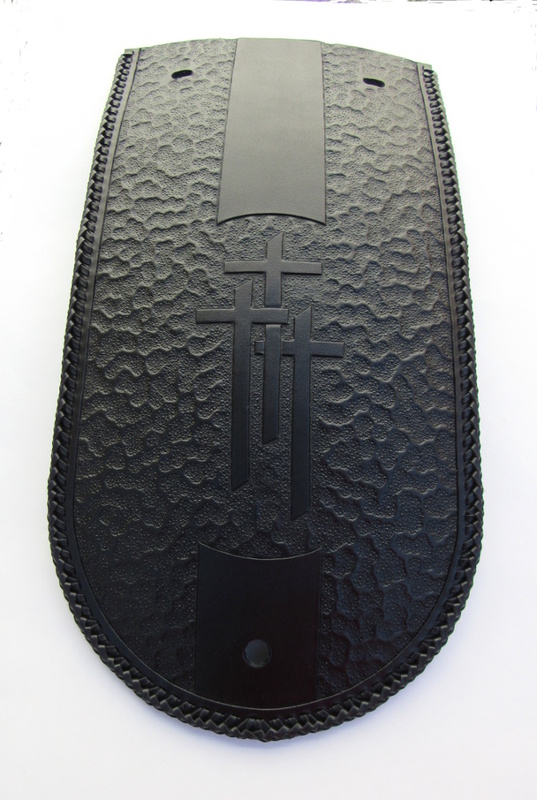 We agreed on a smallish, 4″ diameter x 10″ long back that would strap to the frame between the two parts with the buckles reversed so they wouldn’t touch the fender when the bag was opened. His racing number was hand tooled on the flap and the crest laser engraved on the side caps to tie it all together. Here are the pics, enjoy! Hey folks, Happy St. Patty’s Day! 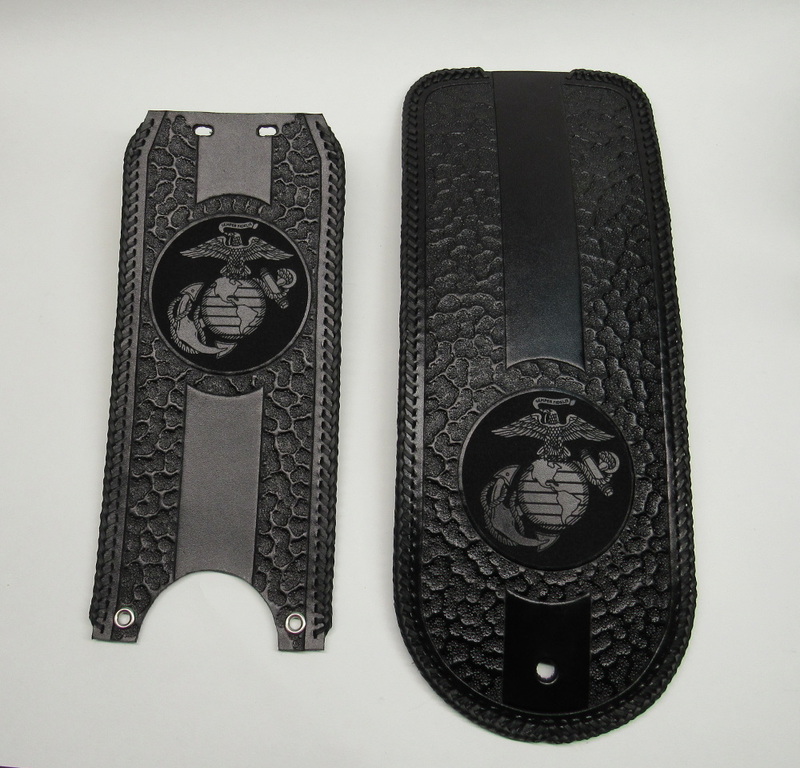 I wanted to touch on matching and coordinating custom tank and fender bibs with your existing theme, color scheme or factory gear. Now, having your gear match isn’t a necessity especially if function is your goal but if you are looking for a clean look to show off at Bike Night and such, coordination can make or break your look. There are a ton of materials out there but in general there are a fixed number of suppliers so getting a good match or a close match for a tank bib or fender bib is usually possible. 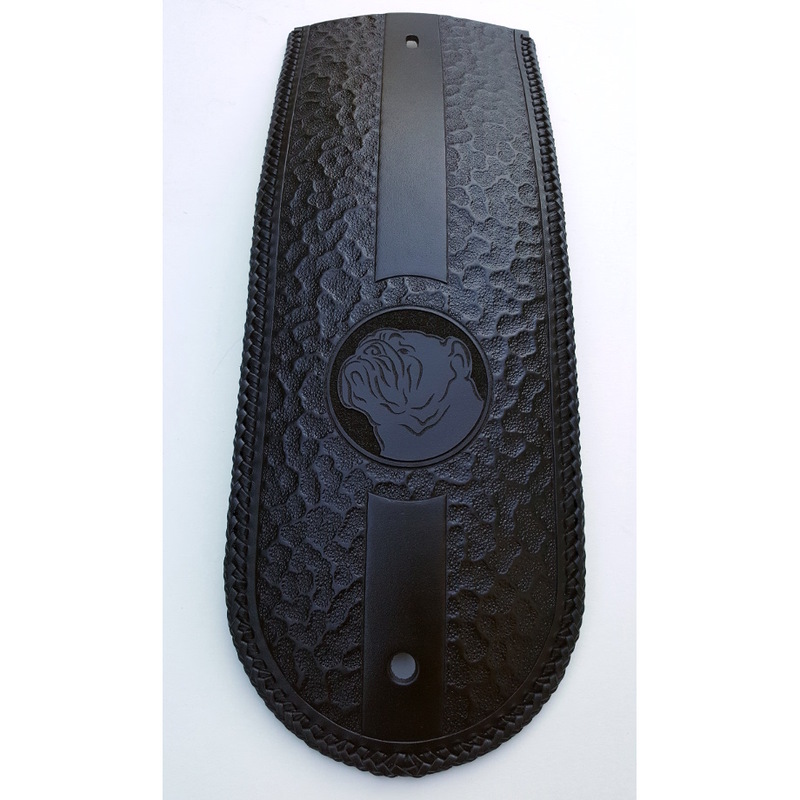 Bigger companies like Harley will subcontract their materials so they are exclusive but close alternatives can be had if you know where to look. Matching another custom maker is also possible when good pictures and references are provided. This post is picture heavy but I wanted to give you good folks some inspiration for your own matched sets and to show what is possible. None of these bikes were local so everything was done via pictures, emails and most importantly…good communication! Three Mutts Customs matched fender bib for the Le Pera two tone seat. 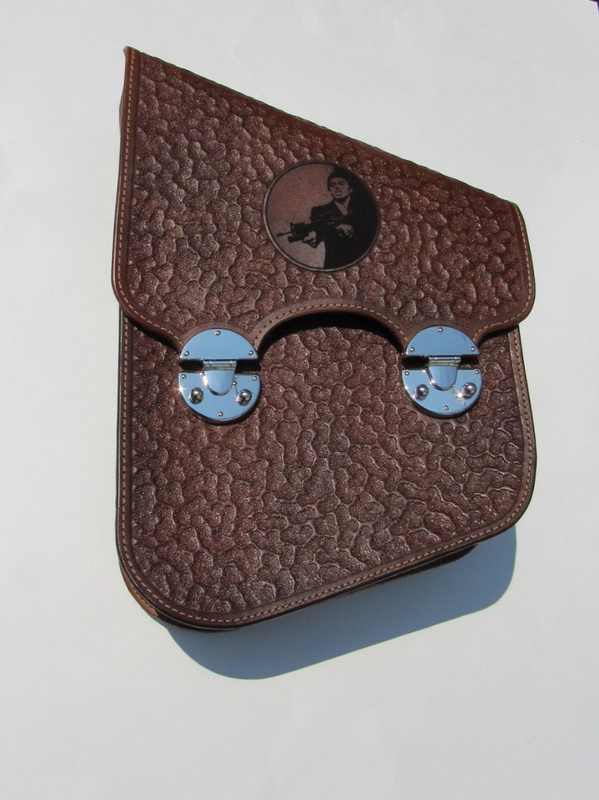 The handlebar bag (different maker) Jessica bib is matched to. The aircleaner insert (different maker) Jessica bib is matched to. 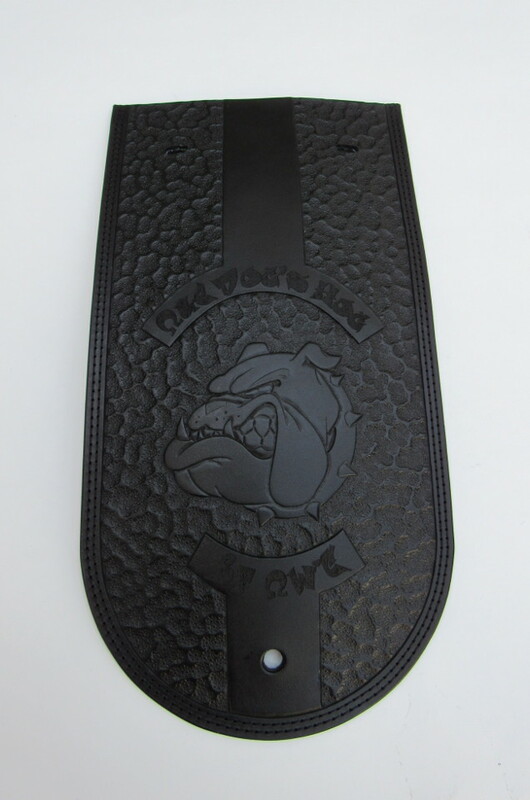 Theme macthing embroidered Three Mutts Customs tank and fender bibs for a Harley Fatboy 110th Anniversary Edition. 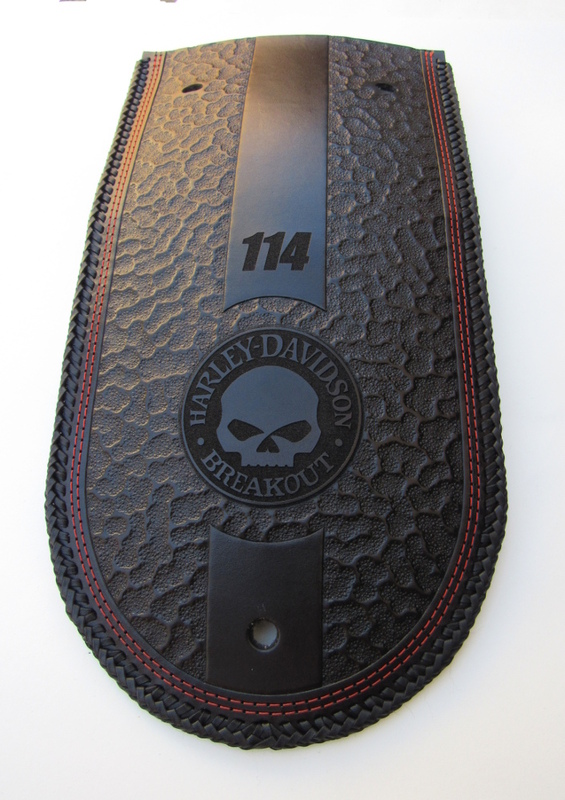 Three Mutts Customs materials matched fender bib for a Harley Blackline with a Danny Gray custom seat. 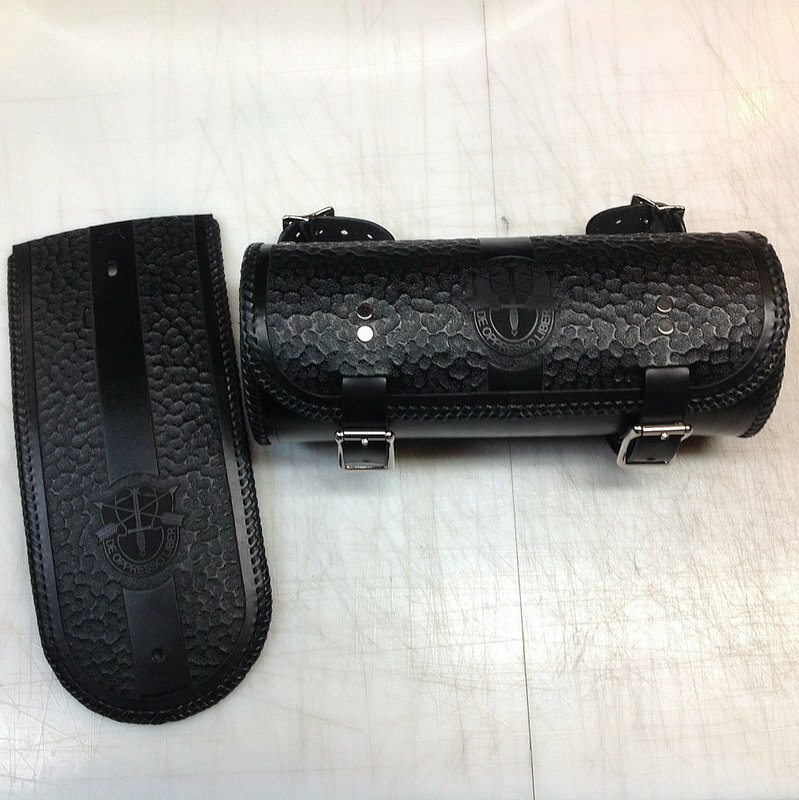 Here are a few of the finished shop pics of a recent fun handlebar tool bag I did for the 2011 Blackline that also sports the Dark Knight Rises themed rear fender bib. Hand tooled vintage Batman logo on the flap, hand painted with Citadel acrylics and hand tooled end caps with the original series style Bat logo. Interior is lined with black sweatshirt fabric (soft & easy to clean). 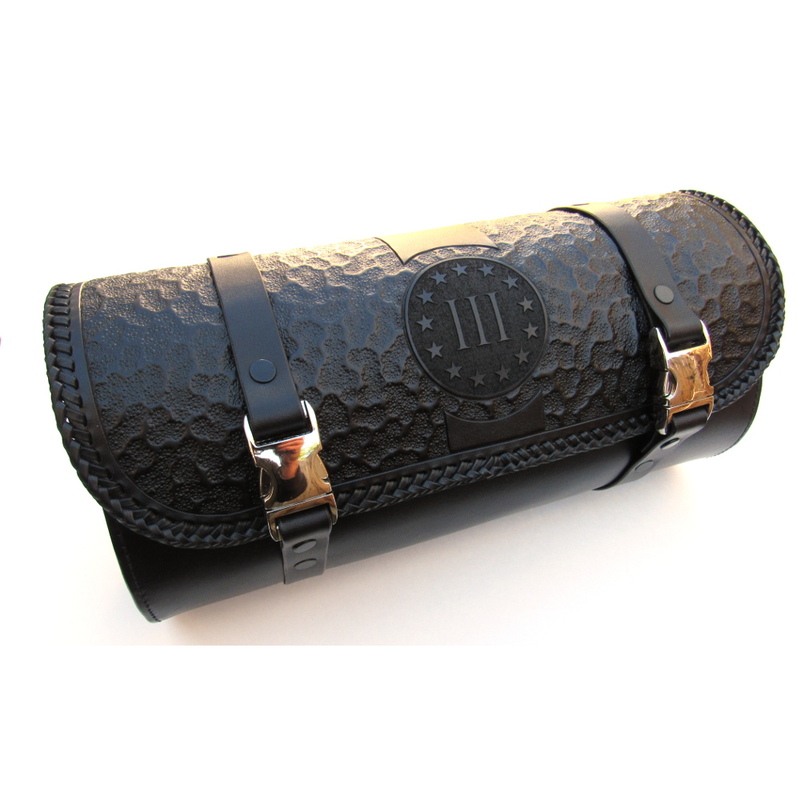 1″ stainless steel buckles and hidden velcro keep the flap down and sealed. 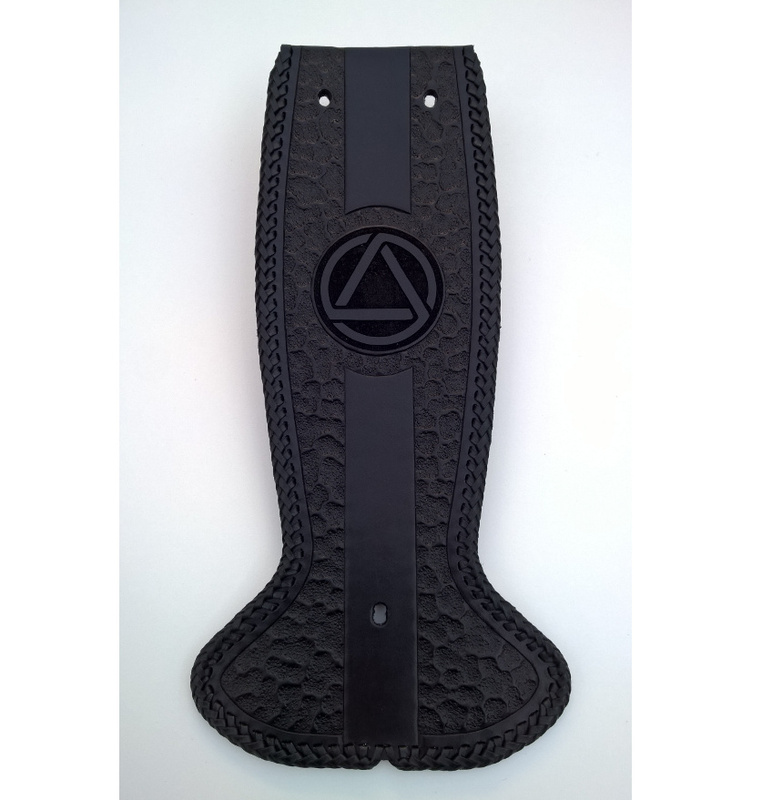 Overall dimensions, 12″ long x 5″ diameter with straps spaced at 5 1/2″ centers specifically for the Blackline but the pattern is adjustable for any width bars, and vertical or horizontal mountings. 2007 VTX1800T whaletail tank bib with all the options!